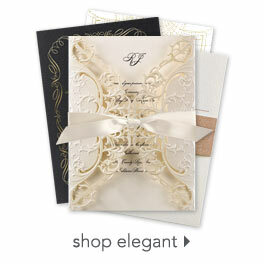 Deeply embossed swirls and filigree cover the front panels of this unique bright white gate-fold invitation. Your wording is featured inside. Size: 4 1/2" x 5 7/8"
Helpful staff. We called in a number of times to ask questions and received polite and patient advice. This is a beautiful classic, " vintage" invitation. We wanted something appropriate for our cathedral wedding. It was an excellent price, really perfect. My fiance and I selected this for our wedding invitation. We were not disappointed. Everything about the card was true to the description and online photo. The ordering process was easy to follow. I especially liked the wording options we could select from. Great prices too! My invitations are exactly what we wanted. Very pleased with how they turned out! I absolutely love these invitations. The quality is beautiful and the price is even better. Thank you invitationsbydawn for helping me to create the invitations of my dream within my price range. I bought these for my wedding invitations. Simple yet elegant. Easily customized with my wording choices and font styles. These were a perfect and affordable choice for our wedding! The invitations were a little smaller than I anticipated once put together, but still beautiful none the less. I have already received many compliments. These are way too small and way too plain for wedding invitation... I had to add some special touches just to make them look more presentatble. Ordered for my wedding and they were exactly what I wanted! Absolutely love them. I used this as my wedding invitation and I was so impressed When they arrived. So beautiful and elegant. The personalization and step by step guide was perfect. We added our own ribbon tying the flaps together making an exquisite statement. Very satisfied with this product and company website. We are using a wax seal to close the invitations. I was amazed at the quality. The paper is so thick, the printing was beautiful, raised up, shiny and almost sparkly looking. The invitations looked exactly as I set them up on the website. I am so in love with these invitations! The email said that the invitations would be delivered within three days. This was not true. I was not worried because I highly doubted that my invitations would be printed that quickly. I believe they took a week or two. Everything arrived in perfect shape. I did not use customer service. I was looking for invitations for my wedding that looked and seemed like they were expensive but in reality were really affordable because I had to have so many and I found these and they came in and they are prefect. I didn't order the ribbon becuase I wanted to add my own twist with twine and a monagrammed tag and they turned out to look really rustic and so cute! Thank you so much! I got them for my wedding. I love them the are simple but cute and very pretty which is what I wanted. People loved my invites for my October wedding. The invitations resembled the pattern of my dress while give the modern antique design i was looking for. BEAUTIFUL invitations. I can't believe how affordable these were and elegant at the same time. I thought for sure I'd have to make my own invitations to get something so nice for the amount of people that we're inviting. Thank you! I choose this product because of its plainess. This way I was able to get the elegant front with the inside printed, while I put a ribbon and a jewel on the front to make it mine. The reason that I didn't choose dawns ribbon was there want many types to choose from. I wanted a sheer ribbon and I didn't see it available. All and all I'm very pleased with what I got. After looking at several different websites for invitations, I finally found these that were a. a simple yet pretty design, b. had matching RSVP and thank you cards, and c. were not expensive. The shipping was very fast and quality was excellent. I opted for the non ribbon version, since I already had a specific ribbon in mind. They turned out very cute! We just ordered for our wedding, they were shipped quickly and we really like them. We would order from this site again for sure. These invitations are great, its what i expected since I did read the reviews about how thin the paper was. What you paid for is what you will get especially when your on a budget. Regaurdless some people will toss them in the trash so why not purchase it for this price. Although I order these without ribbons, I have added a little touch to it to make it look better and also ordered my theme color ribbons. Im happy and satisfied doing buisness with Invitation By Dawn, will definately recommend to family and friends. I recently bought wedding invitations from IBD.com. I love them! My only issue was with the website. I would save what I wanted to print, and when I when back to edit/order, it would SOMETIMES be there, and sometimes not be there! I had to start over multiple times from scratch. Great product, but I was SO annoyed at the website design. These invitations are absolutely beautiful. I thought they were going to be a little bigger but overall there are great!! Beautiful! - Elegant, but not boring. Loved that we could change the quote, that really made our invitations special to us. Printing was professional, no disappointments--they were perfect. Thank you, IBD, for helping make my wedding what I dreamed of at an affordable price! Beautiful announcement. I used it as a wedding announcement to send to all my family and friends. A 4 x 6 photo fit perfectly inside the card. It has a simple, yet classy look to it. I bought these for my wedding and they were a great option for a bride on a budget. The only thing I wish it had was the option to get not only white ribbon but different colors. But overall, these were a great choice, especially since I'm not a fan of invites that don't open up. Love this product, it was beyond my expectations, and didn't cost me an arm and a leg. Would order them all over again! Great Service for a great product! The wedding invitations we ordered was beautiful. There was a small misprint, but I called and the service was great ad immediate. The day I called, the invitations were reprinted and sent out that night and on my doorstep the very next day! Great wedding invitations. Could not ask for anything better for the price we paid. Simple but beautiful. The wedding invitations were just beautiful. The price was exceptional for the whole package or envelopes, invites, rsvp, etc. Very very pleased. My wedding invitations were great: exactly what I wanted for a perfect price. Good quality. There were several designs available-it was nice to have alot of choices. I was looking for a wedding invitation that was simple yet elegant. I found the invitation with ribbon but didn't want to spend the extra money for ribbon so I bought these and sealed them with a wax seal(monogramed "C" for my fiance's last name). They turned out absolutely gorgeous. I love them and am glad I went with the wax seal as opposed to the ribbon.